Add the garlic and rice and stir well. Allow rice to toast for 1 minute. Add the smoked paprika and 1 teaspoon salt and stir to coat the mixture well. Add the black-eyed peas, followed by 2 cups of water or vegetable (or chicken) broth, the beer and minced chipotle chile. Bring to a lively simmer, reduce the heat to simmer, cover and cook for 25 minutes (if using white rice) ~ or 50 minutes (if using brown basmati). Check the rice for both doneness and moisture. The rice and peas should be moist, but not super soupy. If the mixture is too dry, add additional liquid a few tablespoons at a time, up to 1 cup. Return the lid and cook and additional 5 to 7 minutes. Stir and taste, adding more salt as needed. Serve hot with any — or all — of the optional garnishes. I’ll be back to share a champagne dinner tomorrow! PS – just out – a delicious sounding, good-lucking black-eyed pea patty over at Rufus’ Food and Spirit Guide. This looks satisfying and delicious. Can one buy a single can of beer or do they always come in six-packs? If only in six packs, I’ll need to find a lot more recipes besides this one that use beer in them–maybe beer battered tempura or something similar. Just returned from Newport on the Oregon Coast and I’m pleased be able to report that my somewhat cursory investigation reveals a noteworthy improvement in the culinary scene compared with previous years with fresh flavorful food [Spree-type cooking] appearing to be much more widely available than in the past. Happy to hear you had good eats in Newport, Joe. Happy New Year! Oh MAN! I love this kind of stuff. Thanks! What a fabulous, hearty winter meal! Finally! 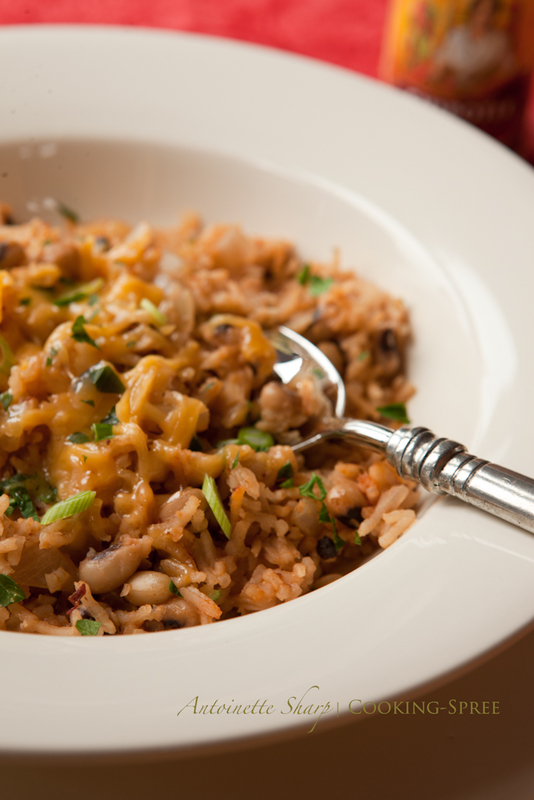 A Hoppin’ John recipe that a northeastern person can make. Every year since as long as I could remember, our cousins in South Carolina have had a New Year’s Day party featuring Hoppin’ John. It’s always been a huge success and I’ve always been longing to try it with a group of friends in New Jersey. Thanks again, Celie, I will start buying the ingredients right away. Yes, finally Hoppin’ John for us Northerners! Happy New Year Ronnie! Yu-u-u-um! I can testify — this is so good! Your recipe sounds great. I have had black-eyed peas for New Years since I was a little girl. You always had to have at least one pea. My husband doesn’t like them so I have to add pork to any black-eyed pie recipe to get him tempted. We do whatever it takes to help them eat their groceries don’t we? 🙂 The one-pea-rule has lots of applications! (and That works on your husband?) Thanks Karen! Happy New Year to you and yours! I’ve heard of this dish many times but never saw a recipe. This looks very good and I cannot wait to try it. Thanks for sharing and I hope 2012 is a great year for you and yours! Thank you so much John! And may the same be true for you and yours! Love this recipe! We will be having this at our place for New Years again this year! Very nice pictures. I need some black eyed pea luck, but black eyed peas, frozen or fresh, are not a French staple. Now there’s a pity Roger! Though it wouldn’t look the same – and I’m not sure it would confer the same luck – I wonder how this would be with flageolets or cannellinis? Heres to your good health and good luck in 2012! WOW! What an amazing looking recipe, and beautiful photos, too! Thank you for posting. I can’t wait to try this! Have you made a big batch and refrigerated? It would be great if I could make a huge batch and eat it all week! Thanks for your comments, “tofubelly”! iI you paired this with a good salad for dinner and you were feeding only yourself it would likely feed you for six days! As good as it is, you may grow tired of it. 🙂 I’ve doubled the recipe for a crowd though and that’s easily done. Would love to see your recipe for black-eyed pea burgers, Lesley! Our champagne supper’s going to be super, and can’t wait to share. Thanks Lesley. Hope you enjoy the smokin’ hopping’ John too. Have never heard of this but it looks just liek our kind of food – the fact that´s a New Year´s tradition makes it even more intriguing. Am going to put this down as one to cook in the next week or so – Happy New Year! 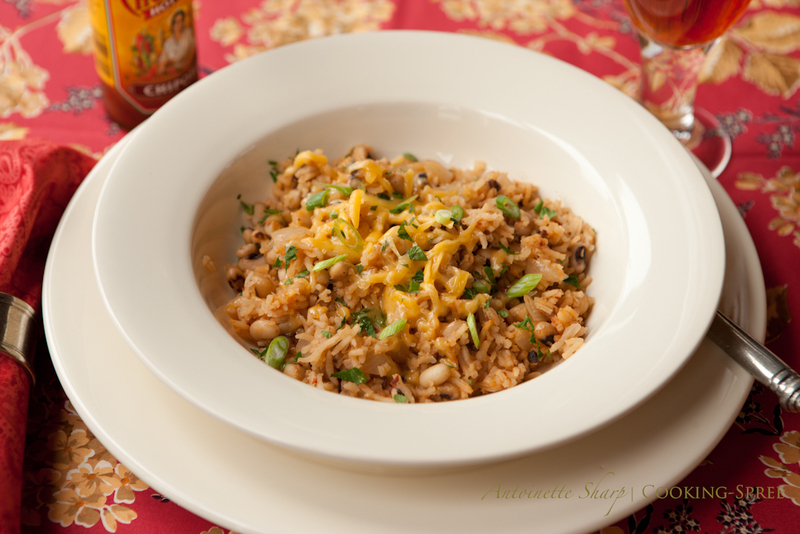 Yes, Chica, beans and rice, smoked paprika and peppers…so Spanish, isn’t it? We’ll be visiting Spain in September and can hardly wait for the heavenly culinary experience! What a treat for all the senses that trip will be! Oh I’m linking back to this too. Awesome recipe! Oh thanks so much for that Rufus!